If you are looking for the best premium managed WordPress hosting to host your website, then this Pressidium review is for you! I have done a lot of research over the years with providers that offer WordPress hosting. I know that Pressidium is on your mind, so today you will get everything you need to know to make get started. Many web hosting providers like them promise a lot, but do they deliver or fall short? Keep this Pressidium review to find out! Pressidium is a managed WordPress hosting leader since its beginning in 2014 that has been catching the eyes of many, including you! If you don’t know already, Pressidium is a globally recognized hosting provider primarily known for its Enterprise Architecture. This in itself is what makes Pressidium hosting rock solid and something to make you look under the hood. So keep reading this Pressidium review! For more details, Go here to www.pressidium.com now! Is WPEngine Better Than Pressidium? The answer in short is NO! Pressidium is way better as a managed WordPress host being that it provides its customers far more value in my opinion. Although Pressidium and WPEngine both offer managed WordPress hosting, they are quite different in many ways. For starters, when you look at these 2 hosts, they both have 4 hosting packages to work with. The WPEngine beginner package starts at $35/month and only lets you host 1 site handling up to 25,000 visitors. This particular beginner deal gives you 50 GB of bandwidth. However, you will notice that Presidium’s beginner hosting plan on the other hand starts at $42/month, but gives you 3 installs, UNLIMITED BANDWIDTH, and handles up to 30,000 visitors! Similarities of WPEngine & Pressidium Hosting..
It’s interesting that both WPEngine and Pressidium hosting offer 60 day money back guarantees, Free site migrations, SSL certificates, CDNs with their managed WordPress hosting. These are all great grabs to have for websites. According to Cloudflare.com, CDNs help get faster delivery of your website content over the internet with servers. To ensure this, Pressidium actually has servers in Oceania, North America, Japan, Europe and Southeast Asia. This type of high end management ensures that your website content loads faster for your visitors. Check out more details here at www.pressidium.com! Who Is Pressidium Good For? In this Pressidium review, I want to be honest and state that Pressidium hosting is great for the those that are looking for above and beyond managed WordPress hosting with lots of resources. It’s definitely not for low ballers and people looking to pay $3 – $5 for cheap web hosting. If you want to see a few that I recommend for beginners, see our resources page. Pressidium is not cheap, but the truth is when you are chasing after cheap hosts, you will always lack something and get exactly what you pay for. Pressidium managed hosting offers rock solid servers that deliver fast speeds. The reason for this is because unlike your typical “shared web hosting” that crams tens of thousands of people on 1 server, Pressidium prefers to do web hosting a smarter way. With less people using servers and having dedicated managers at your finder tips, you can expect nothing but top notch quality. The great thing that you get with Pressidium’s managed WordPress hosting that you never receive with typical shared web hosting is a “dedicated account manager”. Customer service is priority with quicker responses than shared web hosting. Secondly, although “shared hosting” is less expensive, more people are stacked the same servers and will cause websites to load slower or even crash. Remember, with Pressidium, you are working practically off servers with far less users and rock solid security. This is great for anyone that needs web hosting to manage lots of monthly website traffic (up to the MILLIONS!). If you don’t have a lot of web traffic and still prefer managed WP hosting, I recommend using the “Personal Plan” for beginners. It’s a great plan to start experiencing their WordPress hosting. As your website traffic increases and web hosting needs change, you can simply scale up as you want. Who Should Not Use Pressidium Managed Hosting? In this Pressidium review, you should know that Pressidium is not for people that are cheap and don’t want to pay BIG for the best web hosting. It is true that Pressidium is premium web hosting which does cost more. It’s like driving a Mercedes versus a Toyota. Both cars are great, but only 1 car has far more valuable than the other and thus is more expensive. Get the point? When it comes to web hosting you are getting what you paying for. As you can see above, the pricing ranges from $42/month up to $500/month. If you are a beginner and new to web hosting, Pressidium may not be for you as you probably don’t need as many resources. These will become more of a need as your website traffic grows and web hosting needs change. In this case, a less expensive managed WordPress host like Dreamhost , A2 Hosting or WPX Hosting may work better for you. That’s just my opinion and I’m sure you will thank me later. In this Pressidium review, I also wanted to provide you with some alternatives to Pressidium that also provide “managed WordPress hosting”. These many web hosting providers that specialize in managed WordPress services online. Below are 3 that are less expensive options that you can consider to create a website today. WPX Hosting is a Pressidium alternative with plans starting at $24.99/month. For more details on trying WPX, go here to www.wpxhosting.com! Kinsta is a great premium WordPress managed hosting that has plans starting $30/month. For more details, please visit here www.kinsta.com! Know that Pressidium provides a 60 money back guarantee on its managed WordPress hosting. Other web hosting companies that also offer WP hosting like SiteGround, Bluehost offer only 30 days. InMotion Hosting gives 90 days which is close. However, Dreamhost, a cheaper host gives 97 days! NOTE: Although Dreamhost offers a longer money back guarantee, it doesn’t have the fastest page loads, turbo servers and security. Also, Dreamhost ONLY has chat support, whereas Pressidium has both phone & char support that’s way faster. For me, Pressidium is still a better choice. By means of this brief Pressidium review you have more of an idea of what to expect from Pressidium managed hosting when you sign up here. 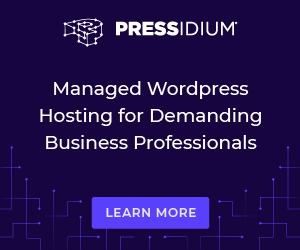 There are many companies that provide WordPress hosting under their umbrella, however Pressidium is “WordPress specific” and specializes only in this all day 24/7/365. That is what really sets them apart from others along with their cutting edge technology and scalable hosting. Secondly, they have rock solid security protecting against DoS attacks & the fastest page loads for WordPress hosting that you will find online. Fast page loads is what both Google & your visitors want from your website. This no doubt will boost your rankings. If you are small business owner who wants to take it to the next level online, it all starts with selecting a great web hosting provider. Pressidium. If you are currently hosting with another provider that you don’t like and would like to have your website migrated to Pressidium today, they will do it for FREE! If you are serious about your web hosting and want a hosting that is 100% reliable with personal dedicated managers, great customer service & performance, then Pressidium is for you! Thank you for reading this Pressidium review! To get started creating your website today, visit their official website here now www.pressidium.com! Previous Post Previous post: Can I host multiple websites on Bluehost? Yes, if you do this first! Next Post Next post: Dreamhost Reviews: An Honest Dreamhost Review You MUST Read First Before Joining!